Biopharmaceuticals, a class of drugs comprising proteins such as antibodies and hormones, represent a fast-growing sector of the pharmaceutical industry. They're increasingly important for "precision medicine"—drugs tailored toward the genetic or molecular profiles of particular groups of patients. Such drugs are normally manufactured at large facilities dedicated to a single product, using processes that are difficult to reconfigure. This rigidity means that manufacturers tend to focus on drugs needed by many patients, while drugs that could help smaller populations of patients may not be made. To help make more of these drugs available, MIT researchers have developed a new way to rapidly manufacture biopharmaceuticals on demand. Their system can be easily reconfigured to produce different drugs, enabling flexible switching between products as they are needed. "Traditional biomanufacturing relies on unique processes for each new molecule that is produced," says J. Christopher Love, a professor of chemical engineering at MIT and a member of MIT's Koch Institute for Integrative Cancer Research. "We've demonstrated a single hardware configuration that can produce different recombinant proteins in a fully automated, hands-free manner." The researchers have used this manufacturing system, which can fit on a lab benchtop, to produce three different biopharmaceuticals, and showed that they are of comparable quality to commercially available versions. Love is the senior author of the study, which appears in the October 1 issue of the journal Nature Biotechnology. The paper's lead authors are graduate students Laura Crowell and Amos Lu, and research scientist Kerry Routenberg Love. Biopharmaceuticals, which usually have to be injected, are often used to treat cancer, as well as other diseases including cardiovascular disease and autoimmune disorders. Most of these drugs are produced in "bioreactors" where bacteria, yeast, or mammalian cells churn out large quantities of a single drug. These drugs must be purified before use, so the entire production process can include dozens of steps, many of which require human intervention. As a result, it can take weeks to months to produce a single batch of a drug. The MIT team wanted to come up with a more agile system that could be easily reprogrammed to rapidly produce a variety of different drugs on demand. They also wanted to create a system that would require very little human oversight while maintaining the high quality of protein required for use in patients. "Our goal was to make the entire process automated, so once you set up our system, you press 'go' and then you come back a few days later and there's purified, formulated drug waiting for you," Crowell says. One key element of the new system is that the researchers used a different type of cell in their bioreactors—a strain of yeast called Pichia pastoris. Yeast can begin producing proteins much faster than mammalian cells, and they can grow to higher population densities. Additionally, Pichia pastoris secretes only about 150 to 200 proteins of its own, compared to about 2,000 for Chinese hamster ovary (CHO) cells, which are often used for biopharmaceutical production. This makes the purification process for drugs produced by Pichia pastoris much simpler. The researchers also greatly reduced the size of the manufacturing system, with the ultimate goal of making it portable. 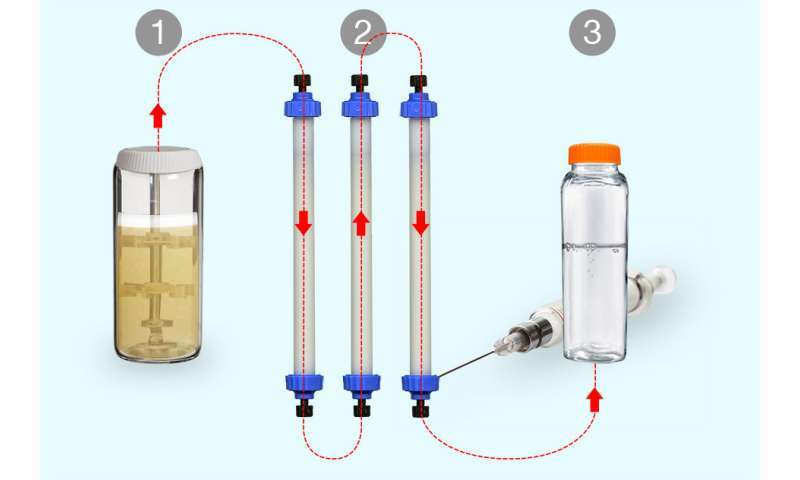 Their system consists of three connected modules: the bioreactor, where yeast produce the desired protein; a purification module, where the drug molecule is separated from other proteins using chromatography; and a module in which the protein drug is suspended in a buffer that preserves it until it reaches the patient. In this study, the researchers used their new technology to produce three different drugs: human growth hormone; interferon alpha 2b, which is used to treat cancer; and granulocyte colony-stimulating factor (GCSF), which is used to boost the immune systems of patients receiving chemotherapy. They found that for all three molecules, the drugs produced with the new process had the same biochemical and biophysical traits as the commercially manufactured versions. The GCSF product behaved comparably to a licensed product from Amgen when tested in animals. Reconfiguring the system to produce a different drug requires simply giving the yeast the genetic sequence for the new protein and replacing certain modules for purification. With colleagues at Rensselaer Polytechnic Institute, the researchers also designed software that helps to come up with a new purification process for each drug they want to produce. Using this approach, they can come up with a new procedure and begin manufacturing a new drug within about three months. In contrast, developing a new industrial manufacturing process can take 18 to 24 months. The ease with which the system switches between production of different drugs could enable many different applications. For one, it could be useful for producing drugs to treat rare diseases. Currently, such diseases have few treatments available, because it's not worthwhile for drug companies to devote an entire factory to producing a drug that is not widely needed. With the new MIT technology, small-scale production of such drugs could be easily achieved, and the same machine could be used to produce a wide variety of such drugs. Another potential use is producing small quantities of drugs needed for "precision medicine," which involves giving patients with cancer or other diseases drugs that are specific to a genetic mutation or other feature of their particular disease. Many of these drugs are also needed in only small quantities. These machines could also be deployed to regions of the world that do not have large-scale drug manufacturing facilities. "Instead of centralized manufacturing, you can move to decentralized manufacturing, so you can have a couple of systems in Africa, and then it's easier to get those drugs to those patients rather than making everything in North America, shipping it there, and trying to keep it cold," Crowell says. This type of system could also be used to rapidly produce drugs needed to respond to an outbreak such as Ebola. The researchers are now working on making their device more modular and portable, as well as experimenting with producing other therapies, including vaccines. The system could also be deployed to speed up the process of developing and testing new drugs, the researchers say. "You could be prototyping many different molecules because you can really build processes that are simple and fast to deploy. We could be looking in the clinic at a lot of different assets and making decisions about which ones perform the best clinically at an early stage, since we could potentially achieve the quality and quantity necessary for those studies," Routenberg Love says. Ok. That is the first truly disruptive technology that I have seen in the last two decades. You can bet big pharma and big insurance are in the panic mode now. If I were these researchers, I would have armed guards around the clock. Unfortunately, for the bloated entities just listed, the genie technology is out of the bottle and even killing these guys won't put it back in. The era of garage bio-labs competing with the gate keepers for lucrative protein and hormones just jumped an order of magnitude in reality.